Happy and Merry Whatever It is You Celebrate! The annual Lou Brutus holiday card has been unveiled for 2015! Art has once again been provided by The Alan MacBain Cartoon Company. 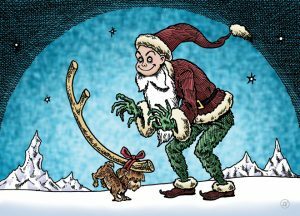 The card features Darla the Wonder Dog and LB done in the style of illustrator Edward Gorey. Quantities are limited! The Lou Brutus holiday card for 2014 has been unveiled. 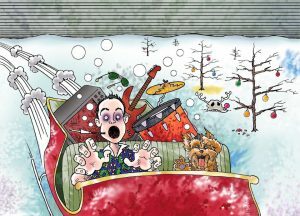 Once again, the artwork has been created by Lou’s longtime partner in artistic crime Alan MacBain of The Alan MacBain Cartoon Company. 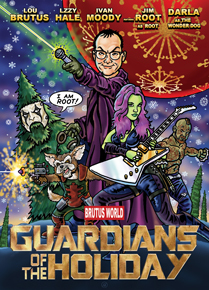 This year the theme is Guardians of the Holiday with Lou and his beloved Darla the Wonder Dog joined by a bevy of rock star friends in a scene from the Guardians of the Galaxy film poster. Brutus takes the Star Lord postion while Lzzy Hale of Halestorm is Gamora, Ivan Moody of Five Finger Death Punch is Drax the Destroyer and Jim Root of Slipknot stands in as Groot. A snarling Darla fires a laser a la Rocket Raccoon. The cards are only sent out to friends and family of Lou’s. However, a very small amount of them will be made available to fans through LB’s social networks. Keep your eyes on the official Lou Brutus Twitter, Facebook and Instagram. Good Luck!